Description: Carbon Auto Theft is back again with amazing third sequel. Just you have to prove yourself in the game. Your job is to steal several cars. At each level you will have to get a different car and take him to the vacant indicated. Be cautious to unlock the car and the alarm can go through all the security and avoid being caught by the police. . 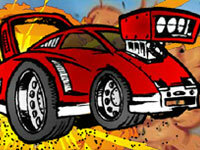 Carbon Auto Theft 3 is a Car Games. Instructions: Arrow keys to drive and space to brake. X to Enter and exit target car/disable surveillance cameras and shift to run..